Note: On the publisher search page, first make sure you are searching for fiction publishers. If not, use the "Switch to" drop-down list at the top of the search page to select Fiction. We highly recommend including this option with every search. Unless the piece you wrote is a specific genre (such as science fiction, fantasy, romance, etc. ), select "General." If you are writing for a general adult audience, we recommend not selecting a specific Audience for best results. However, if your piece is aimed towards a specific audience, such as Young adults, Christians, or Gays/Lesbians, select that in this field. We only recommend selecting a Topic in certain circumstances. In most cases, Topic won't apply, but it's still worth becoming familiar with all the options. Using this option will exclude markets that don't specify what word counts they're looking for, but there's no harm in starting with those markets that we know accept pieces of a certain length. If you do use this option, be sure to also select a Length option. If you get too few results, try changing the search level to Fuzzy or Broad. If you are specifically looking for a market that publishes in print or a market that publishes electronically, select the appropriate option. Enter the medium of the piece you are submitting: Audio, Image, Text, or Video. In most cases, Fiction submissions will be Submission Medium: Text. However, some projects accept audio or video fiction submissions as well, so if the piece exists in those media, you can try those options, too. Check the "Accepts Simultaneous Submissions" box if you are (or will be) submitting this piece to several publishers at the same time. The default option is to sort the search results alphabetically by title, but if you care more about Payment, Response Time*, or Acceptance Percentage*, you may want to use those options instead. Important: The Sort By options marked with asterisks (*) will also eliminate any listings with fewer than 10 fiction submissions reported to us in the past 12 months. If you want to ensure you see all matching listings, avoid using those options. There are some powerful options on this tab for eliminating unwanted search results and ensuring that you don't make any embarrassing mistakes (such as submitting the same piece twice to a publisher or accidentally sending multiple submissions). If you are only interested in Contests, Anthologies (multiple-author collections), Fledgling markets, or listings you've added to Your Favorites, select that option. Here you can exclude Contests, Anthologies, Fledgling markets, markets that only accept submissions from a Limited Demographic, and/or listings that may publish some "Mature" content. 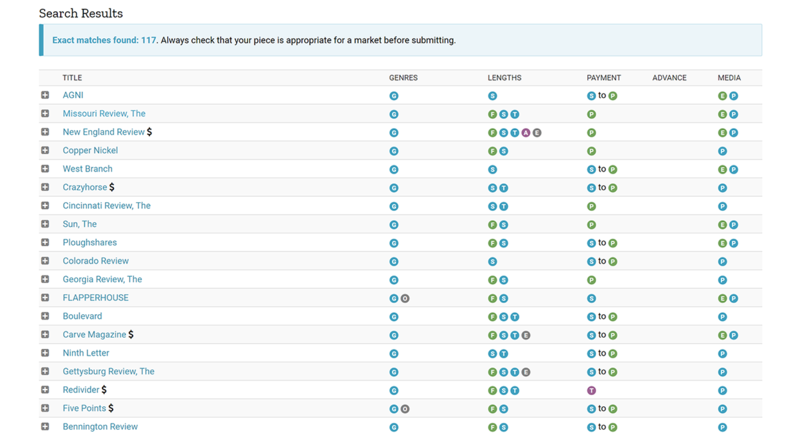 Most publishers, regardless of where they're based, accept submissions from around the world (exceptions will be noted on their listing—also see the second tab for excluding "Limited Demographic" publishers). For that reason, we don't recommend this search option unless you have special reasons for seeking only publishers in a specific country. While this is a fun search option, you should be aware that using it will eliminate any markets with fewer than 10 fiction submissions reported to us. We hope this information has helped you become a better searcher. If you have any suggestions on how we can improve this guide, please let us know.